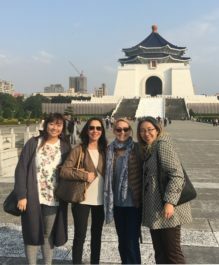 If someone offers you a promotional tour of Taiwan, just say YES. And then be sure you get to go too! 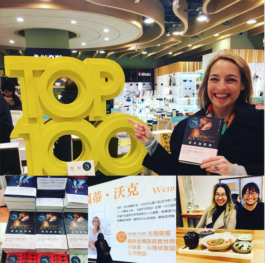 I just returned from two weeks in Taiwan with bestselling author Wendy Walker (All is Not Forgotten and Emma in the Night). 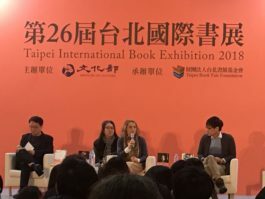 Our Taiwan publisher Ecus Books hosted us for a whirlwind tour that centered on the Taiwan International Book Fair and included 15 events—book signings, talks, panels, and media interviews in 10 days. in any career direction they chose. It was a thrill to see these charming girls line up after the talk to get signed copies of the books and get a picture taken with Wendy Walker. 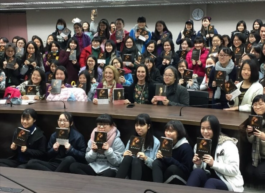 Taiwan is a country of avid readers, warm and inviting people, and beautiful natural wonders. We experienced an earthquake (not recommended) and the colorful excitement leading up to the Chinese New Year (highly recommended). The food of Taiwan is legendary and its reputation is very well deserved. We wined and dined at amazing local restaurants, sampling foods we might never have otherwise tried—stinky tofu, Thousand Year egg, sweet porridge, jellyfish, and a variety of dumplings that I will dream about for some time to come. Ecus’ CEO Vivien Chen hosted several dinners and treated us to killer cocktails that will remain a big part of our Taiwan memories. 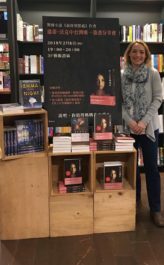 We are grateful for the experience and the generosity and kindness of our hosts at Ecus Books and our co-agent in Taiwan, Whitney Hsu, who handled all the details to perfection. Thank you. Thank you, Thank you. You will stay in our hearts. You can find more fun photos on my Instagram at @wendysherman.